Windows setup installer maker software instantly creates comprehensive executable installer package while maintaining the originality of your software program. Setup generator application provides an effective way for developing minimum size as well as specialized looking executable setup installer of any software files that takes less memory space and turnaround time throughout installation process. Setup creator tool allows the developer to choose customization options such as product name, version, license agreement, copyright text, installation folder and company name. Setup maker utility easily combines all software program files and data into a single self extracting executable file. Setup builder tool is compatible with all major Windows operating system including Windows Vista, XP, NT, ME, 2003, 2000, 98 etc and does not require any specialized skills to operate the software. Windows setup installer maker software shows the entire details of software program including general information, destination path, dialogs, files addition, registry details. Installation software is useful for software developer, application programmer and other users for creating customized setup file. Features: * Setup creator software quickly and automatically creates setup executable file for easy distribution of Windows application program. * Setup installer software provides attractive graphical user interface with install and uninstall options. 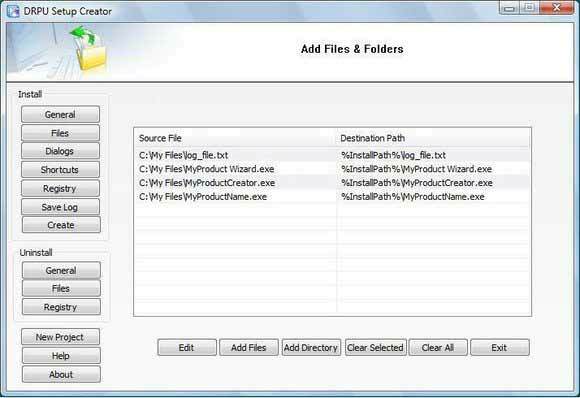 * Setup maker utility allows you to choose program layout such as product name, company name, copyright text, folder path and version. * Windows setup installer maker software is cost effective as compare to other setup maker software and supports all scripting language files. * Setup installer software takes less memory space and turnaround time throughout installation process.